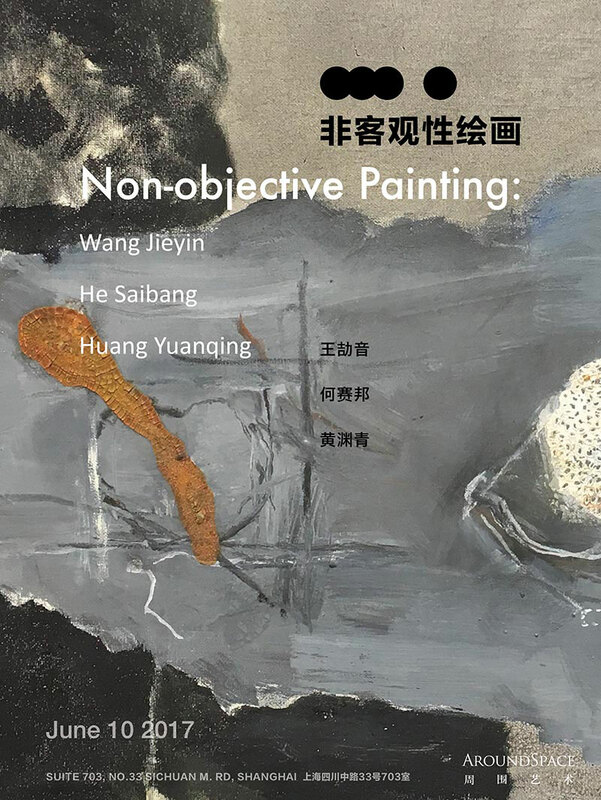 AroundSpace is pleased to announce a trio exhibition of three Shanghai-native artists: He Saibang, Huang Yuanqing, and Wang Jieyin: Non-objective Painting. In the recently released 2017 Turner Prize shortlist, two of four artists chose painting as their primary medium. The judges admitted that they "use tradition as a subject" in "a subversive and interesting way," and "they have a unique perspective that might say something different than the traditions they are working within." The three artists presented by AroundSpace also use painting as their signature medium. Nevertheless, instead of making portraits or landscapes, they project their personal reflection of the objective world on canvas, as well as their perception and interpretation of real life and the art world. In his Li Tai Ming Hua Chi (Records of Famous Painters of All the Dynasties), Tang Dynasty art historian Chang Yan-yüan acknowledged: whoever is good at painting must be a master of calligraphy. This indicates the fundamental concept in Chinese art history - painting and calligraphy share the same origin. All of the three artists' work connote a flavor of calligraphy in different aspects. Huang Yuanqing has practiced calligraphy for years; although he uses canvas and oil (acrylic) paints, the pace and rhythm of his brushstrokes reveal the essential spirits of calligraphy. The way Wang Jieyin renders lines in his paintings remind us of the beauty of epigraphical calligraphy. The well-planned emptiness in He Saibang's work clearly borrows the taste and technique from literati painting. In addition to drawing inspirations from classical Chinese art, the three artists also search for corresponding styles in Western art history. He Saibang's art can be seen as minimalism and conceptual art's incarnation on ink and brushstrokes. Huang Yuanqing's palette shares similar color schemes with American painter Joan Mitchell, while his compositions remind us of Cy Twombly. Wang Jieyin studied oil painting in Vienna, but he did not follow the path of figurative painting; his primitive brush marks and bold colors suggest influence from Henri Matisse and Joan Miró, and his art also pays homage to German Expressionists. Even the titles they choose for their work, mostly Untitled, agree with the Modernists' subversive idea to free painting from serving the purpose of literature, history, and religion. The tradition and classics of art has been growing stronger and stronger. Instead of losing himself in the shadow of tradition and classics, a mature artist rather uses it as sources and subjects, establishing his own style by constantly innovating and changing perspectives. The three artists were born in Shanghai, the frontier where Western art styles and movements have been introduced; they also benefit from traditional Chinese art, such as calligraphy and literati painting. Their art inherits the same legacy, yet each has established a unique style. Presenting their works in one exhibition, AroundSpace evokes a conversation and convergence, between tradition and contemporary, Western and Eastern, in order to show the power and vitality of the backbones of contemporary Chinese artists.